February 12 2017. 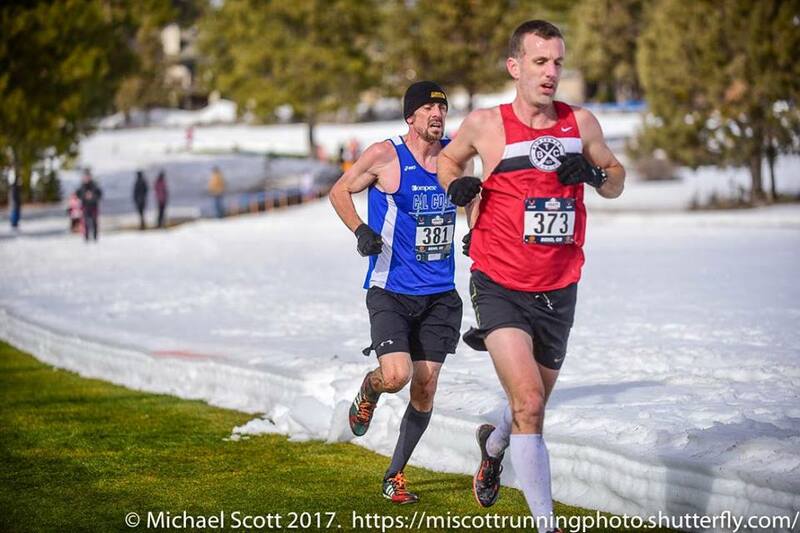 Cross Country bragging rights were on the line at the 2017 edition of the USATF Cross Country Masters Championships at the River's Edge Golf Course in Bend Oregon. The course was designed to be quite challenging by Max King; it has a significant elevation change and frequent slope changes from up to down and across the slope. All had their own challenges. Add to that the fact that Bend had significant snowfall in the week before. Even though the Race Director and his helpers did a fantastic job of snow clearance, the weather conspired against him by warming up the day before the race so that snow melt onto the course led to several very slippery patches that slowed down the wary runners and were a constant threat to those trying to push the pace. There was more than one runner who displayed the 'red badge of courage' on their lower limbs when crossing the finish line. 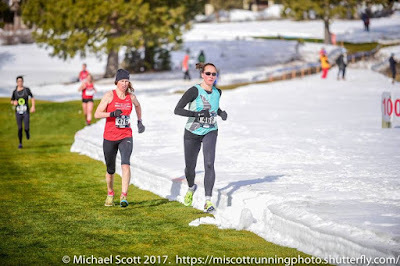 The Women ran three 2K loops for 6K in all; the Men ran 4 loops for an 8K. 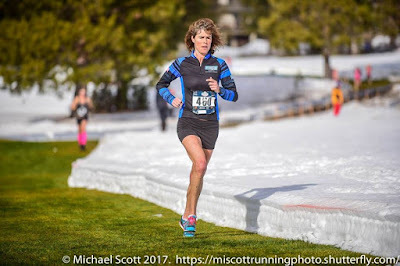 40-44 Melody Fairchild dominated this division as she did the overall race but the rest of the podium was contested by Sarah Raitter, and the Boise Betty teammates, Allison Nuxoll and Sarah Barber. Among those three, Raitter went out fastest, ending the first loop 12 seconds behind Fairchild but 8 ahead of Nuxoll with Barber 3 seconds further back. eventually closing and then passing her teammate to claim the bronze medal by 8 seconds. Sallberg, Howell and Gardiner took 1-2-3 in this division as well as overall. After establishing a modest 7 second lead on the first loop, Sallberg soared away from everyone, adding nearly half a minute to his lead every loop as he ultimately won by 90 seconds. Gardiner and Howell had a stirring battle for 2nd as they matched surge for surge with never more than a second or two separating them. In the final loop, Howell made a surge that Gardiner could not match and pulled away for an 8 second win. David Angell who hung tough with Gardiner and Howell over the first three loops ended up in 4th, 11 seconds back from Gardiner. 45-49 Grace Padilla, who was second overall, won this division by over a minute. 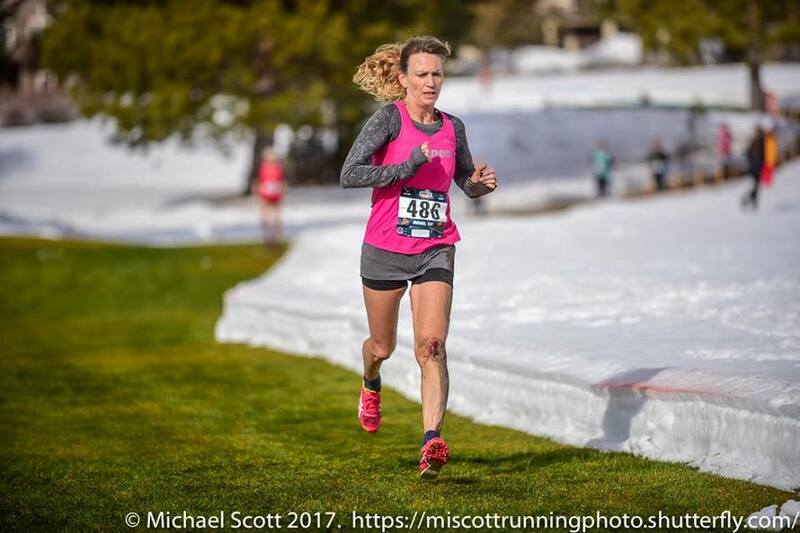 and Angela Lindbo, though not as dominant, led Sonya Wilkerson by 7 seconds at the end of loop1, by 18 seconds at the end of 2 loops and pulled further ahead on the final loop, to take 2nd by 30 seconds. 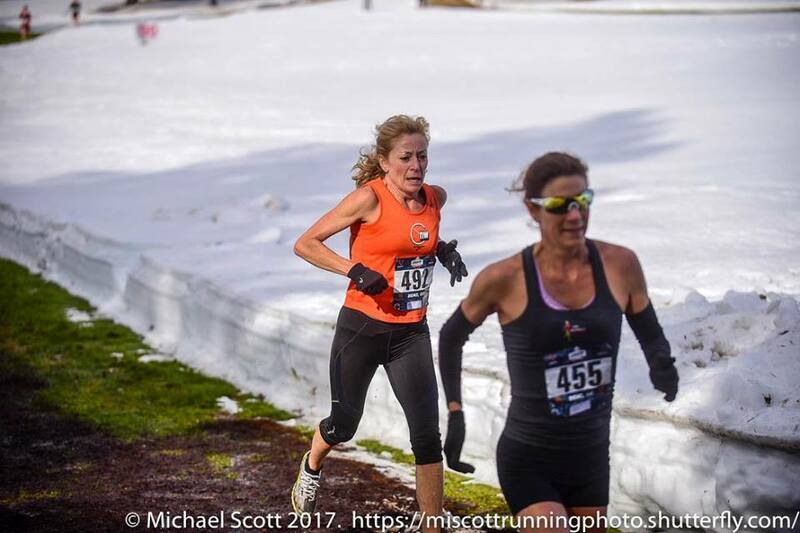 Cindy Abrami and Sonya Wilkerson, who battled for 2nd and 3rd overall last year, renewed their rivalry. 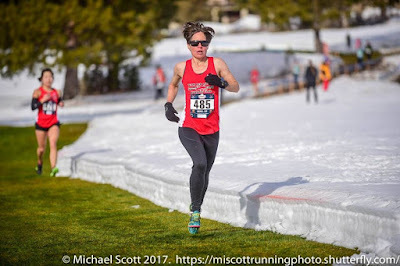 It looked like Wilkerson might reverse their order of finish last year as she led Abrami by 4 seconds at the end of 1 and by 6 seconds at the end of 2 loops. But those two laps took a toll. Abrami turned it up a notch on the final loop while Wilkerson struggled. As a result Abrami was able to close and then pass Wilkerson, growing the margin to 14 seconds by the finish line, and claiming the bronze medal. Wilkerson had to be satisfied with 4th place. Matthew Farley took it out hard on the first loop but Liam Collins stayed right with him, trailing by only two seconds as they headed out for the 2nd loop.Craig Godwin and Steven Frisone were 6 and 11 seconds back respectively. On the second loop Farley pulled away from Collins, who was caught and passed by Steven Frisone. Craig Godwin, also passed by Frisone, moved up to within 3 seconds of Collins. Farley and Frisone added to their respective leads and try as he might, Godwin could not get past Collins. Farley took the division gold medal, with Frisone 16 seconds back in second. A half minute later Collins was over the line for bronze, with an 8 second margin over Godwin. 50-54 Tania Fischer, Susan Hay, and Marisa Sutera Strange took 1-2-3 in this division just as they went 3-4-5 overall. Fischer and Hay had a terific race with Fischer getting out to a 7 second second lead and then Hay gradually chipping away at that lead, taking a few seconds out of it each loop. But try as she might, Fischer's resolve was too strong as she held on for the two second victory. Strange started out at a more measured pace, feeling her way around the tricky parts of the course, but flew on the second to close all of the gap to Hay and pass her, almost closing on Fischer. But then the 3rd loop had the better of Strange and she had to settle for 3rd place. Kirsten Leetch finished 4th and in 5th it was Kathleen Cushing-Murray, who finished between Fischer and Strange at Club XC, but was one of those who tangled with the course and carried the evidence through the race. Carl Combs was looking to repeat his dominant win of 2016 on this course. 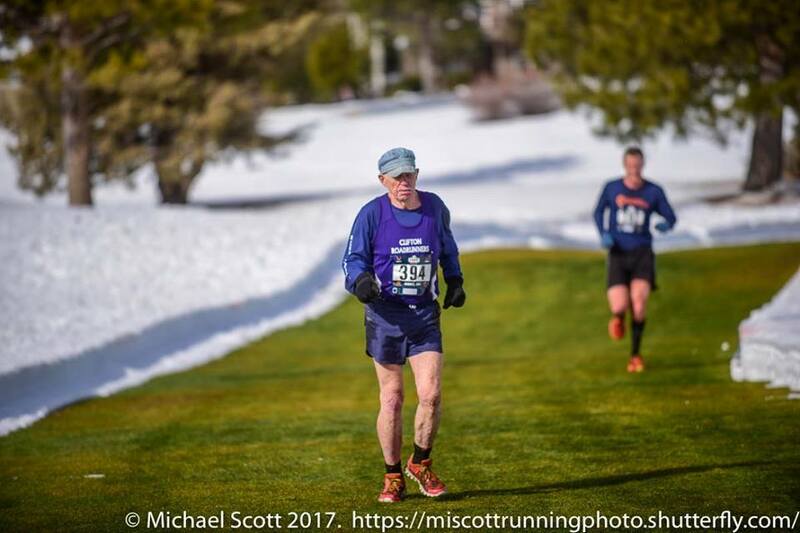 Rob Arsenault is a tenacious runner on the roads and the turf and was probably the only runner likely to give him a battle. The firs three loops played out just like the year before. The first loop saw Combs take a 7 second lead on David Engstrom, with 16 seconds on Arsenault. The second loop saw Arsenault pass Engstrom but lose another 7 seconds to Combs. Heading into the final loop, Combs had 34 seconds on Arsenault and it looked like he could stroll in with the victory. But Combs succumbed to the sick bug that had bothered him before the race on the last loop and that put an end to Combs's repeat chances. Combs struggled, and Arsenault threw in his best loop of the day to claim the victory by half a minute. David Engstrom never threatened Combs, finishing a minute back in 3rd, but with 45 seconds on Rob's brother, Dan Arsenault, who finished in 4th..
55-59 Gail Hall took it out hard, building a 14 second lead over Betsy Miller who, in turn had 5 seconds on Kelly Kruell. Hall accelerated her pace in the 2nd loop as the other two strugled with Kruell passing Miller. Hall took the gold in 28:28 by over a minute and a half, with Kruell 2nd and Miller 52 seconds further back in third. 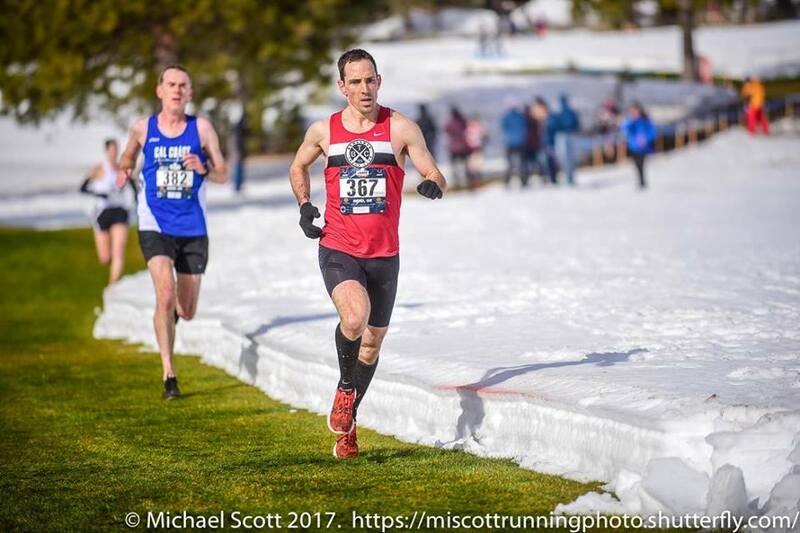 Joe Sheeran, runner up in this division at the 2015 Club XC Championships, gave Pete Magill, winner of the division in the 2016 Club XC Championships quite a battle for the win. Sheeran was a stride back from Magill at the end of the first loop. But Magill wrestled with the course on the 2nd loop and the course won a fall. Sheeran was now up by 23 seconds as he was able to maintain a rock-steady pace. But Magill was not done, taking 7 seconds out of the lead on the third loop when Sheeran's pace flagged slightly. Magill was able to turn it up a notch on the last loop, even though Sheeran again held tough and made him earn every second. In the end Magill had the victory by 5 seconds. So the Course could brag that it got a fall up on Magill, but in the end Magill's wrestling match with the course was decided in his favor. Nate Anderson and Steven Kollars contended for bronze. But Anderson went out 16 seconds faster ont he first loop. In the end that was decisive. Kollars took a second out of the lead on the 2nd loop but then Anderson added 6 to it on the 3rd loop before Kollars took the 6 seconds back on the final loop. So Anderson got the bronze medal by 15 seconds. 60-64 Jill Miller-Robinett had a 3 minute margin on Joanna Harper at the Club Cross Country Championships in December. 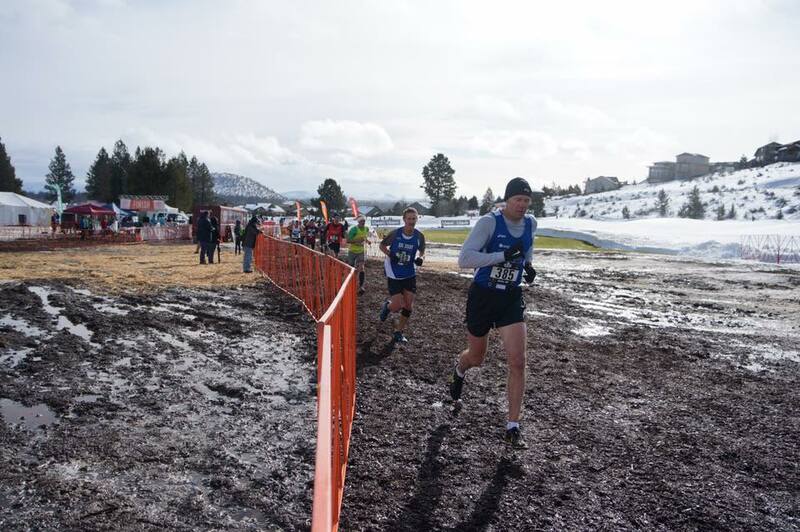 But the course and the tricky footing made this a different sort of contest. Harper and Lynelle Paulick went out in 10:09 with a ten second margin on Miller-Robinett and 25 on Suzanne Ray. Paulick fell back from Harper on the 2nd loop, 26 seconds behind as they headed out for the final loop. Miller-Robinett had closed to within 7 seconds of Paulick and Ray had pulled to within 3 seconds of Miller-Robinett. Harper built her lead on the final loop, finishing with a 47 second margin of victory. Miller-Robinett tried to keep Ray at bay but had no answer when Ray finally passed to claim the silver medal by two seconds. Paulick, who struggled on the last loop came in 4th, a minute back. Gary Radford had a great fall season and it looked like he had had a good winter of training as he finished off the first loop in 8:12 with a 4 second bulge on Greg Wilson, and 7 on Sheldon Subith. Wilson and Subith fell back in the 2nd loop as Radford enjoyed a 26 second lead at the end of two loops. Subith now had a 2 second margin on Wilson. Radford maintained his 26 second lead through the end of the 3rd loop, but Wilson fell another 8 seconds back from Subith. On the final loop Subith took 15 seconds out of Radford's lead but there was too much distance to make up and Radford claimed gold with a 12 second gap back to Subith. In the menatime, Subith had pulled further ahead fo Wilson ending up with a 29 second margin. Mark Rybinski used a strong finish to catch and pass Kevin Clinefelter for 4th place. 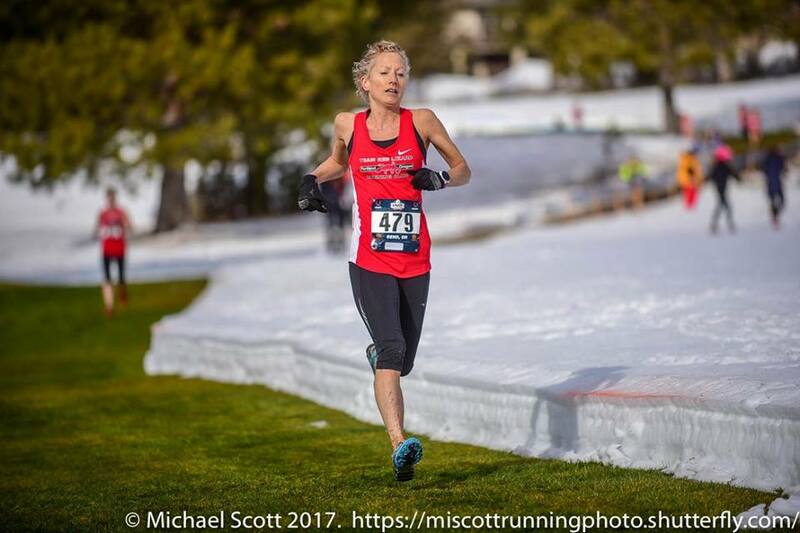 65-69 Jeanette Groesz had not run a road race in three years until she ran a 7:12 mile last summer. 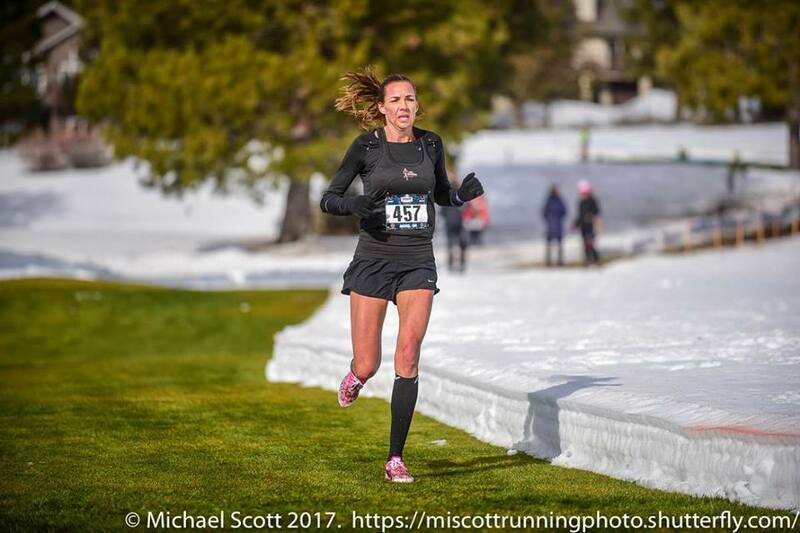 It hardly looked like she was ready to challenge runners like Jo Anne Rowland and Sharlet Gilbert but she was. Groesz had a 20 second lead on Gilbert by the end of the first loop, with Rowland another 20 seconds back from Gilbert. Groesz widened the lead the rest of the way, taking the Gold medal by over a minute. Rowland, who passed Gilbert in the 2nd loop, came in next with Gilbert 50 seconds back in 3rd. 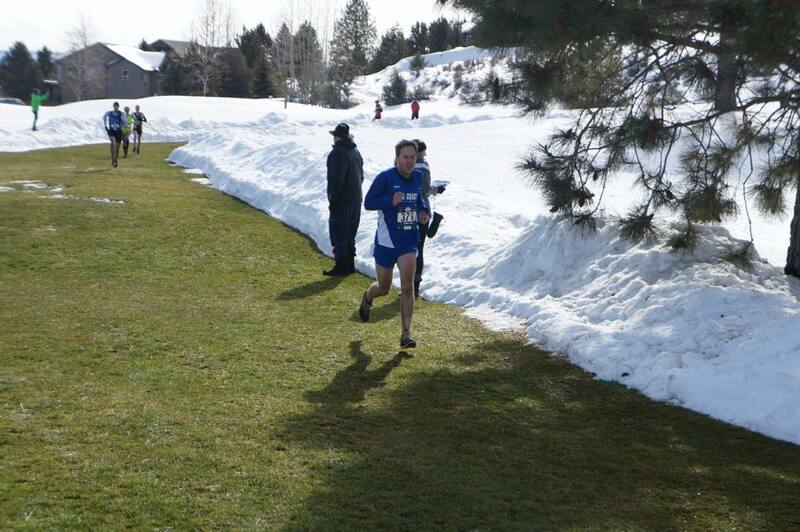 Ignacio Jimenez was in a class by himself in this race, winning the division Gold by almost 4 minutes. 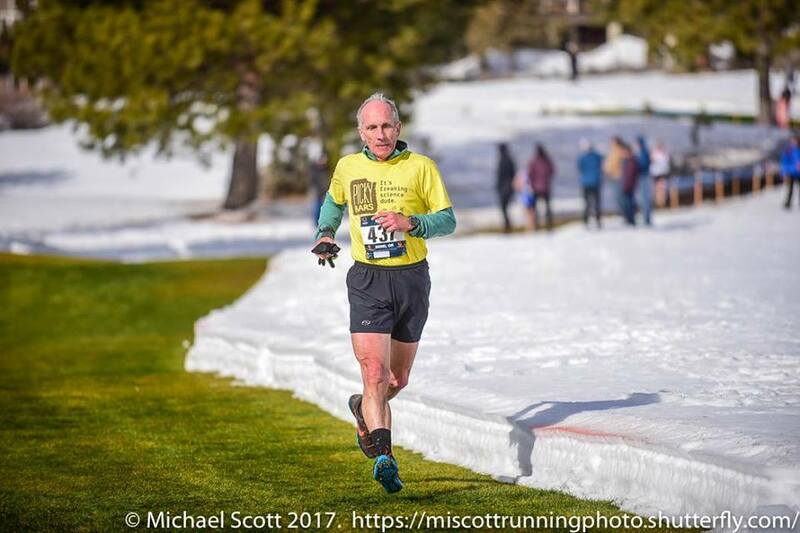 Jerry Learned showed what a tough Cross Country runner he is, fighting off John Hirschberger who took the honors between the two of them at Club Cross Country 8 weeks ago. Hirschberger took an early 3 second lead over Learned. But the Atlanta Track Club veteran reversed that margin by the end of the 2nd loop, added to it somewhat in the third, and then blew their race open in the final loop, taking the silver medal by 17 seconds over Hirschberger. John Barry finished 56 seconds back in 4th. 70-74 Dianne Anderson took this division unopposed in 43:43. Local runner, Paul Caisse, who finished 2nd last year, established a 3 second gap over Gene French in the first loop. French, in turn, had a 45 second gap on Charlie Patterson. stretched it to 5 seconds on the 2nd, and to 6 seconds by the end of the 3rd loop. French closed very slightly on the last loop but Caisse took gold by 5 seconds over French. Patterson hung tough over the last 3 loops, taking third 42 seconds back from French. 75-79 Andrew Sherwood took the gold medal in this division with nearly 20 minutes to spare. Al Swan claimed the silver medal. Congratulations to all who took on this tough course and wound up national champions, hats off to those who wound up on the podium, and to all of those who competed! In contrast to last year, the Women’s teams showed up in this event and enjoyed some spirited competition. And as usual, for both Men’s and Women’s teams, it was primarily a battle royal between the teams from California and those from the Pacific Northwest, with a few Eastern teams mixed in here and there. W40+ Two regional powerhouses from the area, Team Red Lizard from Portland and the Boise Betties from Idaho aimed to defend the Northwest against the efforts of the California team, rabbit racing. Also competing was the Oiselle Running Club. Despite the national affiliation that name suggests, it is apparently a chapter of the Oiselle brand that is based in Seattle. The Boise Betties had the top two finishers but then the Red Lizards’ took the next two spots and 5th to earn the title 13 points to Boise’s 15. The rabbit racing team took the bronze with 25 points. 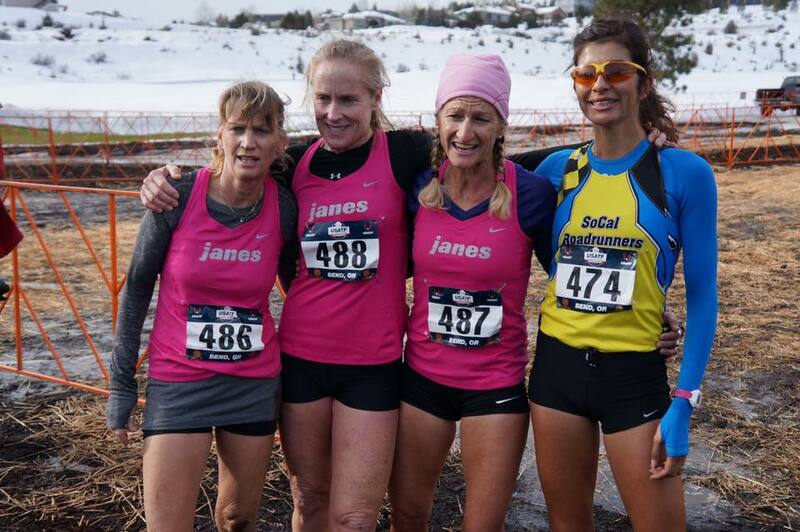 Congratulations to Team Red Lizard: Angele Lindbo, Jennifer Seibel, Sonya Wilkerson and Janna Heinonen. W50+ One eastern team, the 2015 Masters Grand Prix Champions, the Athena Track Club, challenged Southern Cal’s the Jane’s Elite, Portland’s Team Red Lizard and Seattle’s Club Northwest in the 50 and up division. The first 3 runners finishing were from Jane’s, Lizard and Athena in that order. But then the Jane’s took the next two spots and the race for gold was over as Jane’s was in with 10 points. When the 2nd and 3rd runners from the Red Lizards finished ahead of the next two from Athena, the race for team silver was also done as the Lizards had 16 points to Athena’s 26. Congratulations to the Jane’s Elite: Tania Fischer, Kirsten Leetch, Kathleen Cushing-Murray and Kelle Taylor. W60+ The Impala Racing team from the San Francisco Bay area went home with the 60 and up trophy last year but Team Red Lizard put forth competitive teams in each division to limit the California dominance. And they were successful here too, taking the top two spots and fourth as well, winning 7 to 14. Congratulations to Team Red Lizard: Joanna Harper, Suzanne Ray, and Jeanette Groesz. In terms of regions, that made it two for Oregon [Pacific Northwest] and one for Southern Cal. How about the Men’s teams? M40+ Two Oregon teams, the defending Champion Bowerman Track Club and, who else, Team Red Lizard sought to protect the home turf against So Cal’s Cal Coast Track Club, Sacramento’s River City Rebels and Santa Barbara’s rabbit racing.Bowerman and Cal Coast split the top two spots but when the Bowerman team claimed 3rd, 4th and 5th, it was all but over. When they took 7th also they had the win with 20 points. 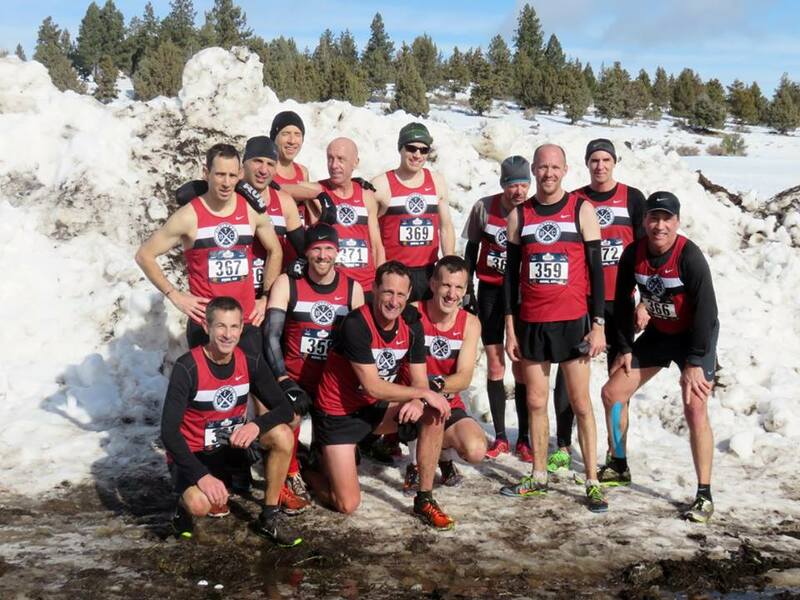 Cal Coast was comfortably in 2nd with 51 and the Red Lizards closed off the podium with 83 points, two ahead of the River City Rebels. Congratulations to John Howell, Greg Mitchell, Matthew Farley, Orrin Schumacher, Joshua Gordon, Ahrlin Bauman, Oscar Baumann, and David Ross. M50+ The 50 and up division was strictly Cal Coast TC against the Bowerman TC. Cal Coast got the first two spots but Bowerman had the next two so it was still anyone’s game. Cal Coast nabbed the 5th position but then a Bowerman runner nipped a Cal Coast runner for sixth so they had a chance still. But when Cal Coast had the next runner in too, they were in the gold medal position with 23 points to Bowerman’s 33. Congratulations to Rob Arsenault, Pete Magill, Dan Arsenault, Thomas Schumann, Bob Brisco, and Mike Filippow. M60+ It was East vs. Southern California. 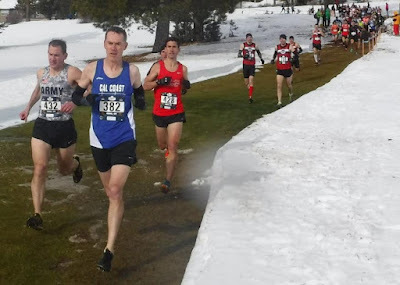 The Genesee Valley Harriers made the trip from upstate New York to challenge the Cal Coast TC and the San Diego Track Club. 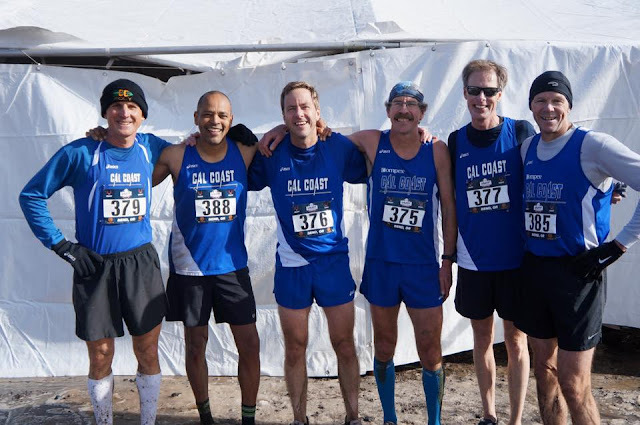 The defending champion Cal Coast team could never get untracked, finishing third with 24 points but the other two teams were in a ‘dog fight.’ Cal Coast got 1st but then San Diego took 2nd and 3rd. When GVH’s 2nd runner came in 4th the 2 teams were tied. But that only lasted 4 seconds as GVH’s 3rd runner crossed the line that close to their 2nd runner. GVH won with 10 to San Diego’s 11. Congratulations to Gary Radford, Mark Rybinski, Kevin Clinefelter, Bill Beyerbach and Tim McMullen. M70+ The Atlanta Track Club made the trip from Georgia but no one showed up to defend the home turf. 1-2-3 adds up to 6 points and the win. Congratulations to Charlie Patterson, Sam Benedict, Curtis Walker, William Shaffer, and Andrew Sherwood. 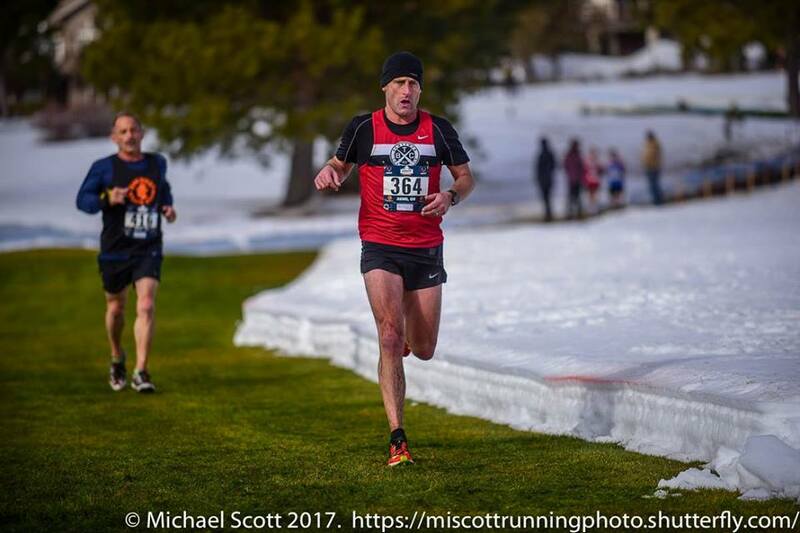 The Men’s victories were split up with one each for the Pacific Northwest, Southern California, the Northeast and the Southeast. So overall, the Pac NW got 3 wins, So Cal 2, the NE and SE 1 each. The home turf was well defended. That kicks off the 2017 Masters Grand Prix. From Oregon the tour turns next to Virginia and the 8K Championship at Virginia Beach on March 18th and then the 10K Championship in Dedham Massachusetts on April 30th. 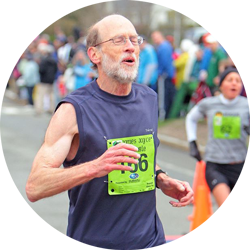 The Half Marathon Championship on May 7th in Orange County will finish off the spring season.